Munro is a city of the Vicente López Partido in northern Greater Buenos Aires, Argentina, best known for its jeans and apparel stores and outlets. It is located some 20 km from the downtown of the city. It is bordered by the neighborhoods of Villa Adelina, Carapachay and Martínez on the north; Villa Ballester on the west; Florida Este in the south; and Olivos to the east. 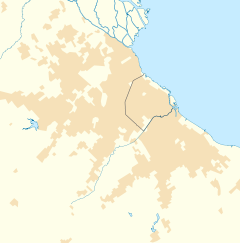 The border streets are Mariano Moreno, Bartolomé Mitre Avenue, Paraná, National Highway 9 (Panamericana), Antonio Malaver, Alexander Fleming, Luis María Drago, Primera Junta, Montes de Oca, Capitán Cajaraville, Juramento, Carlos Calvo, Albarellos, and Belgrano. There are many sports clubs in Munro such as Unión Vecinal de Fomento Munro (founded on 1922), Olivos Rugby Club (1927), Club Unión de Munro (1946), Club Social y Deportivo Industrial Munro (1947). Some of Munro's local industries are: Atanor, Fabriloza, Colorín, Virulana, Ripán, Telagoma, Bayer, Gillette and other factories of clothing, lumber, steel, food, etc. In the town were located the Lumiton filming studios (they still exist today as a museum of the movies filmed there). The city area is approximately 5.8 km² and is populated by 35,844 (2001 census [INDEC]), being the third most populous city in the partido, with 13.1% of its total population. In 1991 there were 36,188 citizens, which implies a 1% drop compared to 2001. 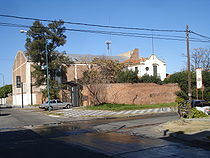 The neighborhood of Munro was born with the construction of a station of the Ferrocarril Córdoba Central rail line (now Ferrocarril General Belgrano) on April 30, 1912. The English railway company, associated to the Compañía Argentina de Tierras del Norte, acquired lands near the railway and charged its station chief, Alfredo Dionisio Godoy, the lands sale. The station has its name after Duncan Mackay Munro, who worked at the railway company. On June 11, 1922, 49 neighbors led by Alfredo Dionisio Godoy founded the Unión Vecinal de Fomento de Munro. With the population growth, many stores were opened that formed an important commercial centre. Munro was also the site of Lumiton Studios, a movie production house founded by local radio pioneer Enrique Susini which, from 1931 to 1952, turned out over 180 full-length films and became among the best-known in Argentine cinema. On November 11, 1961, the partido's first school was founded: School Nº4 Domingo Faustino Sarmiento. On March 22, 1965, the Santa María Reina church is founded, and from 1996 it belongs to the San Isidro obispado. In 1981 Mitre Avenue was repaired, thus modernizing the commercial centre. In 1995 the Centro Cultural Munro (Munro Cultural Center) was inaugurated with a capacity for 870 people. The area once had a German school, Deutsche Schule Munro. The most important activity is football, in which Club Atlético Colegiales is the most distinguished club. Wikimedia Commons has media related to Munro (Buenos Aires).